Post Transaction Surveys | Always listening. Conducting a once a year customer survey. Always listening. Providing multiple opportunities for customers to give you feedback immediately after interacting with you. Why wait? Your customers have opinions on your performance. They have them now. And they are willing to tell anyone who’s happy to listen. Social media anyone? These opinions will often cover what you’re doing well, what you could improve, and your customer’s perception of how you stack up against the competition. So why wait to hear these opinions? We all know that memory fades with time. Decay Theory proposes that memory fades due to the mere passage of time. Information is therefore less available for later retrieval as time passes and memory, as well as memory strength, wears away. So the best time to collect customer feedback is ‘in the moment’ when it is top of mind. And with the advent of mobile optimised online feedback, demand for Post Transaction customer surveys is exploding. So what post transaction surveys are companies running? A regional architecture firm runs a Client End of Phase survey. At the conclusion of each major phase of the design and build process customer’s opinions are sort about their experience and what adjustments need to be made prior to commencing the next phase. 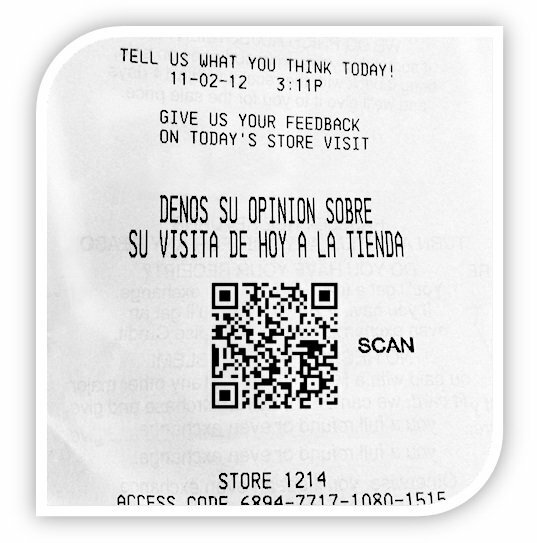 A national retail chain has printed a QR code on the back of their till receipts asking for customer feedback on their in-store experience. Surveys are mobile optimised and respondents are offered a discount code for 10% off their next purchase. A publicly listed recruitment company seeks post service feedback and referrals from job applicants upon each role being filled, as well as from hiring managers about their experience with their recruitment consultant. A telecommunications company that sends service technicians onsite to assist residential customers emails a feedback request within 24 hours after the visit. A national legal firm runs a post mandate survey asking clients for feedback on their experience and using the opportunity to grow their business by gauging customer interest in other related services. If you only solicit formal customer feedback once every year or two, what happens when your customers are unhappy mid way through the year directly after their most recent transaction with you? Without a formal process to listen to customer feedback after every key transaction with you, you risk above average customer churn rates. Indeed often customers will stop buying from you without you even knowing. Why wait for feedback to become stale? 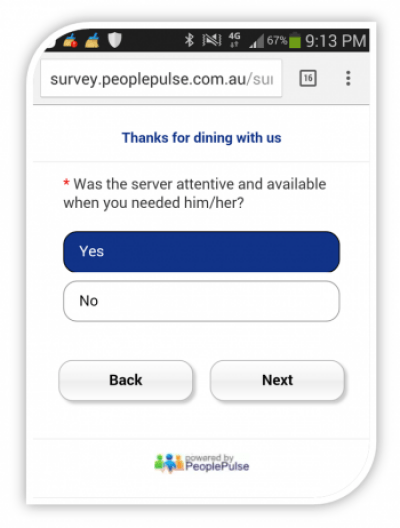 Use PeoplePulse’s Mobile solution to capture feedback while it’s still fresh in the mind of your customers. Getting a post transaction survey right requires careful planning and the right expertise. Trust our Project Managers to ensure your survey runs in an efficient and effective manner from start to finish. This combination of exceptional software and unmatched support & advice works to ensure that your post transaction survey is set up professionally without fuss, and that ultimately your survey delivers you the insight you need to make better business decisions.